Graphical DIN sized panel meters for electrical measurement and process display. Wanted: International distributors! Contact us. 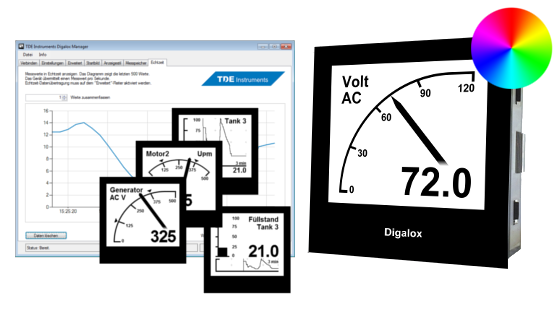 TDE Instruments Digalox® graphical measuring instrument which unites the easy read-out of an analogue display with the accuracy of a digital instrument. The unit can be switched between volt and ampere measurement via an external switch. Minimum and maximum values are recorded and can be displayed optionally using an external switch. Measured values are recorded over a timespan of three minutes up to 14 days. The timebase as well as the display of the measuring history can be activated by an external switch. The following parameters can be adjusted using the USB-Software: Scale-endpoint, scale-caption, display-style (pointer, tachometer, bargraph and more), splash display, thresholds for alarm output, hysteresis and more. Recorded measurement values can be read as well as a continuous transmission of the actual measuring value enabled. Using the software, values can be viewed and exported as CSV.